Corrosive chemicals can pose serious hazards to people and the environment. These dangerous materials are present in almost any workplace and if not stored properly, they can damage costly equipment and in humans they can burn and destroy body tissue; as soon as topical contact is made. Corrosive storage lockers can provide safety and security for storing corrosive substances. Read below to learn more about how to safely handle, transport and store strong corrosives. Corrosive storage locker by US Chemical Storage. Corrosive chemicals, in weak and strong concentrations, can present a wide range of hazards including poisoning, burning, deterioration and explosion. Serious injury from corrosive chemicals can result from exposure in either liquid, solid or gaseous states. It is necessary that not only proper storage requirements are met, but personal protection is mandatory when handling or transporting corrosive substances. When personnel are handling or transporting strong corrosives, they should always wear skin-protective clothing and eye wear. Acid-proof aprons, acid suits, face shields, gloves, safety shoes and other protective clothing should be worn before dealing with corrosive materials. Obtain Material Safety Data Sheets (MSDS) for each type of chemical being stored to understand the hazardous classifications associated with each chemical. To prevent potential hazards, corrosive materials should be stored in a compliant corrosive storage locker. Separation of incompatible materials is paramount to increase the safety of personnel and facilities. Segregate incompatible materials with solid partition walls or by using separate corrosive storage lockers to remain fully compliant. Segregate acid corrosives from alkaline/bases. These chemicals are highly reactive with each other and can cause serious hazards if stored together. Prevalent acid corrosives include sulfuric acid, acetic acid, nitric acid, aluminum chloride, and hydrochloric acid. Common alkaline/bases include sodium hydroxide, sodium hydride, alkoxides, butyllithium, and ammonium hydroxide. Corrosive chemical storage should be maintained in a dry, cool atmosphere away from heat sources, including sunlight. Providing corrosive storage with a maintained atmosphere can eliminate the probability of vapors building-up, which can lead to ignition or combustion. 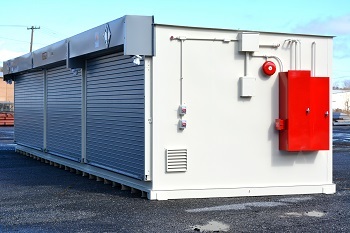 Depending on storage application, corrosive storage lockers should be equipped with mechanical ventilation, temperature controlled systems and gas detectors to increase personnel safety. Mechanical ventilation systems are designed to remove vapors and toxic fumes that corrosive materials give off. Gas and spill detection devices can be installed with alarms on corrosive storage lockers to alert personnel of a leak or a spilled substance. Are you prepared for storing corrosive materials? Stay safe and remain compliant. Visit us online or call 888-294-2729 to get a free quote on a corrosive storage locker today.